International Economics: Theory and Policy provides engaging, balanced coverage of the key concepts and practical applications of the two main topic areas of the discipline. For both international trade and international finance, an intuitive introduction to theory is followed by detailed coverage of policy applications. 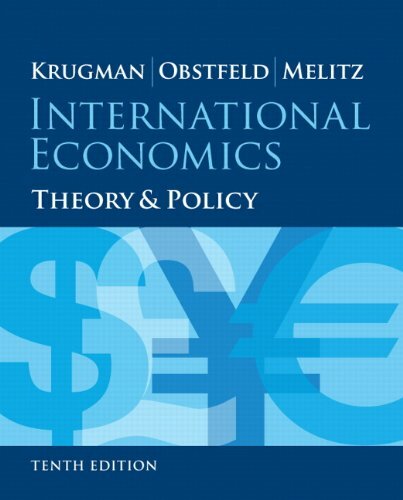 With this new tenth edition, the author team of Nobel Prize-winning economist Paul Krugman, renowned researcher Maurice Obstfeld, and Marc Melitz of Harvard University continues to set the standard for International Economics courses. • Personalize learning with MyEconLab: This online homework, tutorial, and assessment program fosters learning and provides tools that help instructors to keep students on track. • Reveal theory and applications of trade and finance via a unified structure: Balanced coverage of theory and applications aids student retention and highlights the relevance of course material. • Give students learning tools to master course material: Numerous in-text learning resources engage students and encourage further exploration of course topics. • Provide the most updated coverage: Thoroughly updated content ensures that students are up to date on key economics issues. Note: If you are purchasing the standalone text or electronic version, MyEconLab does not come automatically packaged with the text. To purchase MyEconLab please visit www.myeconlab.com or you can purchase a package of the physical text + MyEconLab by searching for 0133826945 / 9780133826944. MyEconLab is not a self-paced technology and should only be purchased when required by an instructor.